Call Us Today for Prescription Glasses! 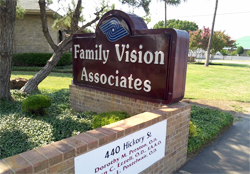 Family Vision Associates is a group of 3 optometrists, or eye doctors, who cater to the needs of their patients in the Abilene, TX area. Contact us if you need a therapeutic family care optometrist. We provide eye care services to our patients such as thorough eye exams, contact exams, and contact lenses. Our patients can also get prescription sunglasses through us as well. We also offer surgery co-management and treatment for eye diseases and infections. Our practice is built on professionalism, honesty and a strong sense of caring. 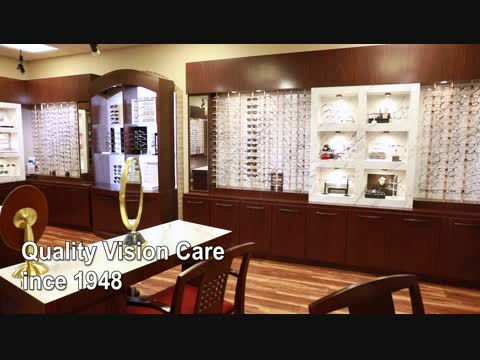 Our goal is to meet the needs of our eye care family now and in the future. We pledge to practice state-of-the-art optometry. By staying in the forefront of optometry and staff education, we will provide you with the best eye care and materials you look for in an eye doctor. The concerns of our eye care family will always be of the utmost importance to our eye clinic. Our Eye Doctors Provide Complete Eye Exams - We Serve Abilene, TX! We know your vision is important to you – and it’s important to us. When you come for your appointment, we make sure to schedule ample time for your appointment so you will never feel rushed. Our family optometrist provides complete eye care for both adults and children. Our comprehensive eye exams will check your eyes inside and out for any potential eye disorders or diseases. Your visual skills and abilities are carefully evaluated during our eye exams and appropriate treatment is prescribed, whether it’s medication, lenses, or vision therapy. We are prepared to handle your eye care needs, and will treat them with the latest in diagnostic equipment and are committed to keeping up with eye care and eye exam technology. When you are in the Abilene, TX area looking for a family optometrist office to get an eye exam, you can rely on Family Vision Associates. Call us today! We Offer Quality Contact Lens Exams and Contact Lenses! With contact lens exams, our professionals can help fit you into a pair of contact lenses that are just right for you. We are experts in fitting contact lenses and can handle the most specialized needs. Whether rigid or soft lenses, we are experienced in handling the most difficult of prescription glasses. It is important to get a contact lens exam when getting contact lenses. We want you to have the best fitting contact lenses to minimize irritation. Choose us for your eye exams today and let us give you the best vision we can! Contact lenses are the perfect option for patients that don't want to wear glasses. There are options for disposable & extended-wear contact lenses. With so many different options, we are sure that you will find contact lenses that fit your lifestyle. If you have allergies, then you know allergies can be particularly annoying to contact lens wearers. In the past many people had to quit wearing their lenses during the allergy season. However, new lens materials, contact lens solutions and allergy medications have made it possible for these people to eliminate the burning itchy eyes associated with allergies. Prescription medications such as Patanol and Alocril are amazingly effective and safe even in children as young as three. Let us know when you come in for your appointment if you have special allergy needs and we will be happy to help you. We are the go-to therapeutic family care optometrists in the Abilene, TX area. When you need special eye care, we are here for you. Call us today if you need therapeutic optometrists. Our optical laboratory has the latest in equipment to not only fabricate your prescription glasses, but to maintain and repair them should they become broken or damaged. We are able to tint, coat, harden and edge spectacle lenses. We are also able to provide you with almost any frame or lens design available. Our highly qualified opticians and staff are able to adjust and fit your glasses to you for extended comfort and vision. We carry a wide variety of eyeglasses, including designer glasses by Versace, Donna Karan, Kenneth Cole, Ralph Lauren and sunglasses by Oakley! You'll never have to worry about bringing a few different pairs of glasses and sunglasses with you to get the proper protection and vision. Don't rely on clip on shades anymore! With our prescription sunglasses, you'll receive the perfect vision you need during those sunny days in Abilene, TX. Choose us when you need prescription sunglasses! We are proud to announce the addition of Optomap retinal screening technology at our office. We are concerned about retinal problems including macular degeneration, glaucoma, retinal holes or detachments and systemic diseases such as diabetes, stroke and high blood pressure. These conditions can lead to serious health problems including partial loss of vision or blindness, and often develop without warning and may progress with no symptoms. Optomap is fast, easy and comfortable. Optomap does not require dilating drops (in most cases), which result in blurred vision and sensitivity to light. A flap is surgically cut in the cornea and gently folded back. An Excimer Laser is used to reshape the cornea into a flatter or steeper shape (this is much like a contact lens corrects vision by forming a new shape on the cornea). The flap is then put back in place, acting like a natural bandage. The healing process is quick and the discomfort level is quite low. People will often say that they did not feel anything, and could see well the very first day. Most people have improved vision in 24-48 hours. But it must be noted that each person will heal at a different rate. Vision, although greatly improved immediately after surgery, often continues to improve for some weeks, even months. LASIK is not for everyone. People's eyes are different so even though you may have had a friend who has had LASIK, it may not be the best course of treatment for you. If you are interested in laser vision correction, we will be happy to guide you in picking the right surgeon, procedure and laser appropriate for you. After the procedure, we take great care to monitor your eyes and work in conjunction with your surgeon for the best possible results. 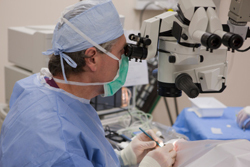 Our office co-manages many of the surgical services such as Cataract surgery, Laser surgery, Refractive surgery and Strabismus surgery. We work in conjunction with the local eye surgeons (ophthalmologists) for your care. Additionally, we have working relationships established with other specialized eye care doctors to co-manage such things are retinal detachments, retinal tears and hemorrhages. Our office provides emergency services for eye infections and eye injuries. Please call our office at 325-677-6225 during office hours, after hours or on weekends. Our staff will work with you to schedule an appointment as soon as possible. After assessing the extent of the injury or infection a treatment plan will be formulated and explained to you. Treatment may include medications and supportive care. Follow-up visits to monitor your recovery will be scheduled as needed. Dry Eyes: Symptoms include scratchy eyes, burning, mild redness and gritty feeling eyes. Oral medications, reading, contact lenses, computer tasks and dry environments may aggravate marginally dry eyes. Dry eyes can be diagnosed by using dyes to observe tear patterns, evaluation of the amount of tears on the front of the eye and from review of your symptoms. Treatment may include artificial tears; eye drops for treating allergies; and/or punctal plugs inserted in the tear drainage canals. Glaucoma: Glaucoma gradually destroys the optic nerve tissue in the back of the eye. The greatest danger of glaucoma stems from the fact that the disease is painless and without obvious symptoms until significant damage has occurred. The most common cause is from pressure being too high inside the eye, but vascular disease and other diseases can also cause glaucoma. We monitor for glaucoma during routine eye exam procedures. Tests include checking the pressure of the eye, screening for peripheral vision defects and analyzing the appearance of the optic nerve. If you are diagnosed with glaucoma, you are typically prescribed medications that lower the eye pressure. Most forms of glaucoma are successfully treated with eye drops. Laser treatments and eye surgery are secondary treatments that offer alternative ways to treat more advanced glaucoma. 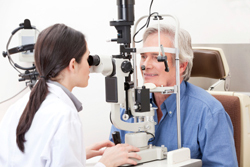 Diabetes: Diabetic patients should have a dilated retinal examination each year. Diabetes can often stimulate the growth of new blood vessels in the back of the eye, which may ultimately leak and damage the retina. Laser treatments have proven to slow the progression of retinal eye disease for many patients. If this condition is discovered early, laser treatment can destroy these vessels. If we discover advancing diabetic eye disease that needs further evaluation or treatment, we will refer you for consultation and further testing to a board certified retinal specialist. People who have lost eyesight due to injuries or eye disease need special types of products to help them function as independently as possible. We can coordinate low vision/vision rehabilitation services for those patients. When you are looking for experienced therapeutic optometrists in the Abilene, TX area, rely on the staff at Family Vision. For contact lenses, contact lens exams, prescription eyeglass and prescription sunglasses, as well as other eye care services, the eye doctors at Family Vision treat you the best. Call us today for an appointment. We look forward to see you. Services provided at our office include: Eye Examinations, Optical Dispensing, Contact Lenses, Surgery Co-Management, Management of Eye Diseases; Cataracts, Glaucoma, Diabetes, Eye Infections, Eye Injuries, Dry Eyes.